Inspiring Sports Movie: the Movie! My All American is the story of an underdog college football player who became an inspiration. It was written and directed by the same guy who wrote Hoosiers, which begs the question: did the guy who wrote Hoosiers get hit in the head or something? Angelo Pizzo also penned the script for Rudy, so this true life story finds him in a familiar neighborhood. In the 1960s, Freddie Steinmark was an undersized Colorado high school standout who found himself passed over by most college football programs due to his stature. Legendary coach Darrell Royal gave Steinmark a chance with a full scholarship to the University of Texas, and Steinmark worked his way to team leader before chronic pain led to a cancer diagnosis. Sports movies often come pre-loaded with inherent cliches, but Hoosiers and, to a slightly lesser extent, Rudy, overcame them by avoiding sweeping generalities to embrace smaller moments with finely drawn characters. My All American takes the opposite approach. You’d be tempted to pin the anomaly on this being Rizzo’s first try at directing, if the script itself wasn’t equally culpable. There’s no depth at all here, just one-note characters, swelling music and soaring shots of football stadiums. Finn Wittrock (Unbroken, American Horror Story) is passable as Steinmark, but he’s saddled with a role that is more saint than flesh and blood. 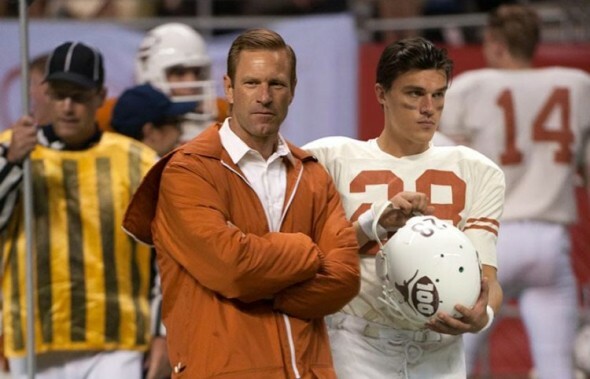 We learn in the introduction that Steinmark was never named an All American at Texas, yet the film paints him as perhaps the greatest player to ever suit up. Rizzo gives Wittrock no edges to make Steinmark’s influence resonate, and the multiple times other players tell Freddie “I wouldn’t be here if it wasn’t for you,” carry zero weight. That’s right, Jim, and that water they have on the sideline sure looks wet. No doubt Steinmark’s is a story worth telling, but My All American needs more from Jimmy Chitwood’s playbook.